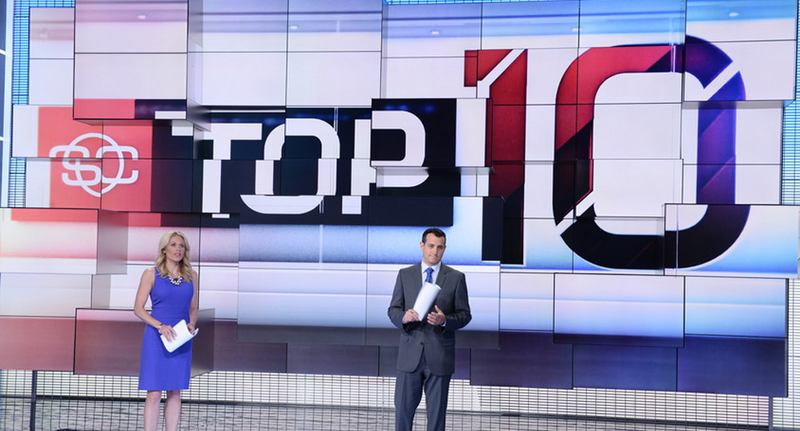 If you had walked on to the previous “SportsCenter” set when it debuted ten odd years ago, you no doubt would have been impressed with the numerous on-set monitors; if you took the time to count them, you’d come up with a total of 15. Fast forward to 2015 — and the set now boasts more monitors than can be casually counted. Those 114 monitors are divvied up across multiple venues in eye-popping configurations that many manufacturers said couldn’t be done, says Chanan S. Averbuch, EVP at Primeview, the company that engineered and deployed the massive array of video displays on the “SportsCenter” set. “Because of the unique configurations the design team at Jack Morton envisioned, we had to develop completely new and unique manufacturing strategies, problem solve and engineer how all of the displays would look, function and be mounted,” Averbuch said. 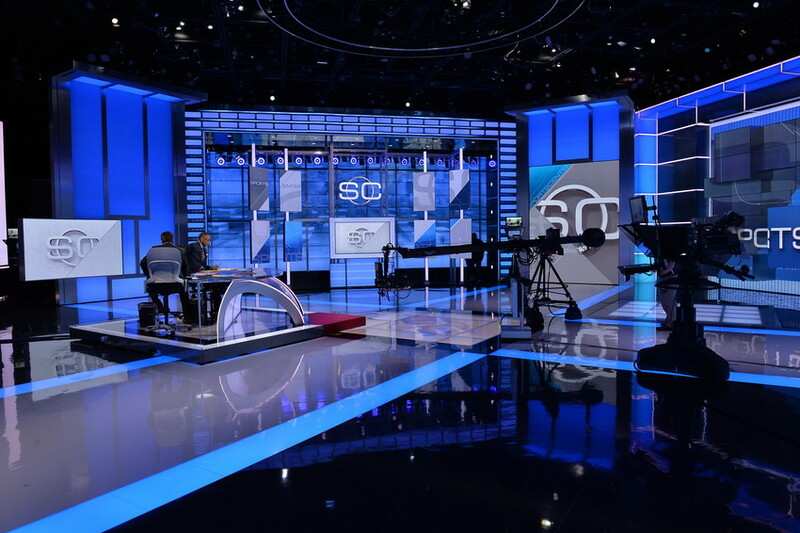 The new set was part of a larger project of ESPN moving its venerable “SportsCenter” program into a massive new studio in Digital Center II on its Bristol, Conn. campus. The new set features a sprawling wraparound production area next to a two story working newsroom. ESPN was especially focused on finding new, highly visual ways, to integrate its storytelling with on-set technology that could interact with talent and be used in a myriad of flexible options. Just hearing the stats can be mind-boggling — when it debuted, the set included seamless plasma displays that were up to 60-inches in size. Filling out the rest of the 100-plus on set monitors are screens ranging from 21-inch to 46-inch sizes, all of which are professional grade. Of course, displays of this caliber can’t be picked up at a local electronics store, Averbuch pointed out. Instead, display manufacturing and integration experts like Primeview are needed to bridge the link with clients looking for display solutions that will hold up to the vigorous demands of broadcast environments. However, the process doesn’t end with picking out the right video panels. These types of monitors require unique power, calibration and video integrations that also go beyond the typical “plug and play” systems most of us are used to using in our homes. This makes working with a seasoned manufacturing expert in projects of this magnitude all the more important. “Even if your set isn’t going to be stocked to the level of ESPN’s — and most won’t be — the partner you select is still vital,” explained Averbuch, who continued by pointing out that Primeview’s experience in massive projects such as “SportsCenter” means that it’s armed with the problem solving, vendor relationships, professional services and engineering skills to make any size project a reality. 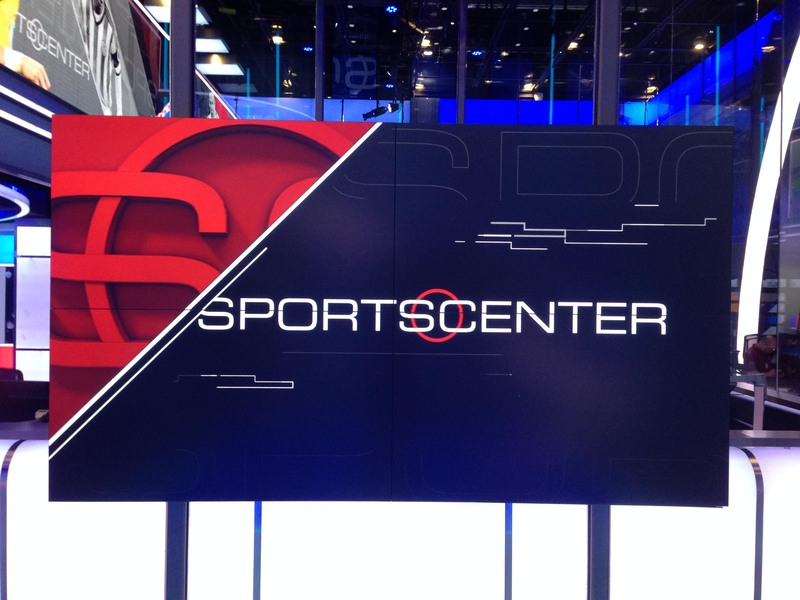 Perhaps the most eye-catching part of the “SportsCenter” studio is the north wall of the set, which includes a slew of near bezel-less displays arranged in a layered, extruded pattern. Meanwhile, the west wall, which was dubbed the “Debate Wall” includes a mix of scenery and 60-, 46- and 55-inch professional grade panels. 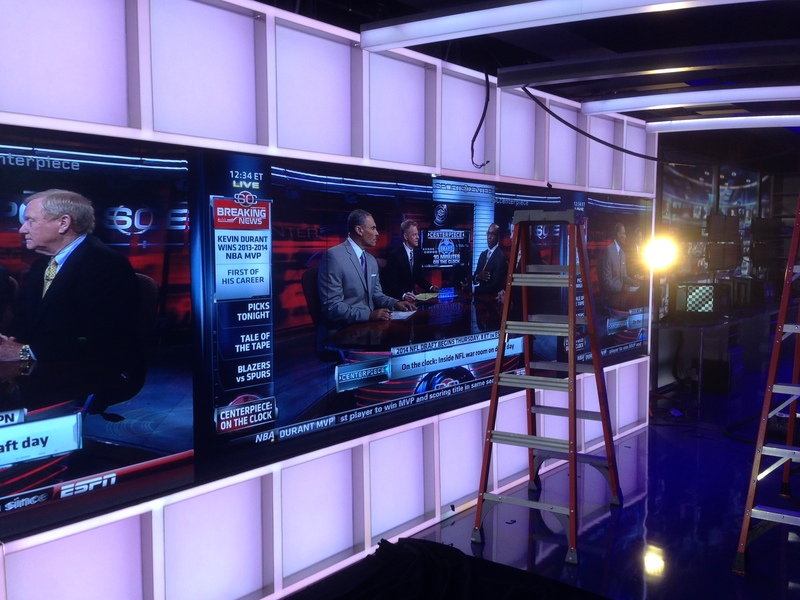 Throughout the studio, it was vital to ESPN that all of the video panels be consistent in terms of image quality, brightness and other factors, which made Primeview’s role as a premium display manufacturer vital. In many cases, the displays needed to make the vision a reality didn’t exist — and had to be created from the ground up, another thing only possible when working directly with a manufacturer. Another key challenge of this project was that the display systems had to be able to run for almost 24 hours a day. For the installation, Primeview flew in expert engineers from its manufacturing facilities around the world to work directly with the team at ESPN and Jack Morton to coordinate the entire installation process as well as color calibration and on-site testing. These experts also worked alongside the graphics system integrator to ensure a cohesive and efficient workflow. Despite the massive scale of the main set, Averbuch pointed out a unique feature of the studio that further drives home his team’s experience with smaller scale projects — the “Annex” studio. Located just off to the side of the working newsroom area, this smaller studio is used for a variety of ESPN productions and boasts smaller, yet no less impressive, video panels. One side of the area looks over the newsroom, just as the main “SportsCenter” set does, and includes a large video panel used for standups and topical graphics. The area is also equipped with a long wall that mixes video displays with backlit panels, giving the network additional storytelling options. 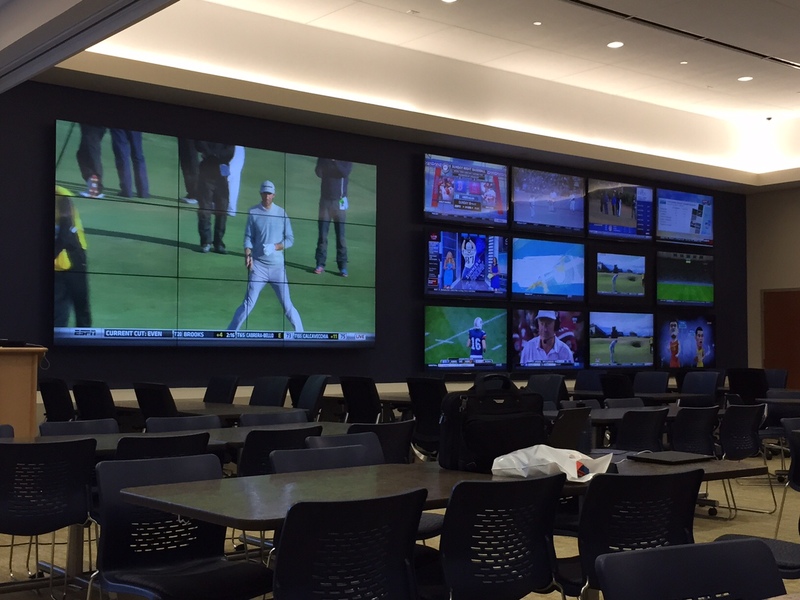 Riding on the success of its massive “SportsCenter,” ESPN also worked with Primeview to outfit its new employee wellness center on the Bristol campus with the same high-tech video walls featured on the network’s sets. For more information about how Primeview’s expertise and exclusive manufacturing capabilities can give your project the big displays and big impact it needs, get in touch with the team here. The above content is sponsor-generated content from Primeview. To learn more about sponsor-generated content, click here.